If you're looking for death-defying stunts and mind-blowing circus skills, this is most certainly not the show for you. But if you are, however, after some camp and feelgood comedy with a dash of aerial pageantry thrown in, Aaron Twitchen will promise to have you both in awe and fits of laughter before the hour is up. Packed with Twitchen's observations on feeling old and out of touch, searching for the ideal partner, and growing up as a gay man in not-so-diverse Devon, Curtain Twitchen is an energetic romp through relatable and familiar discussions of success, self-love, and social media's role in our feelings of inferiority. 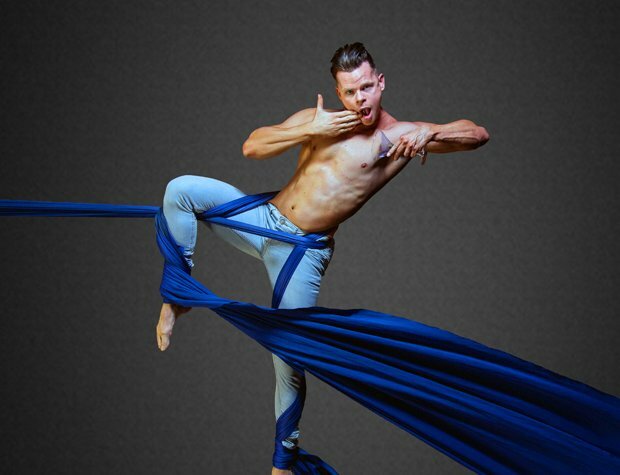 The show's focus is not on the aerial silks on which Twitchen spends his time twisting and somersaulting around in between segments, and this may be disappointing for those that expect comedy and circus to intertwine seamlessly. Despite this, Twitchen manages to engage the audience with his endearing demeanour, self-deprecating humour and relentless innuendo-filled anecdotes which make up much of his set. Though his skills up in the air are striking and distinct additions to an otherwise fairly standard stand-up routine, it's his cheeky and cheerful presence, and larger than life personality that really provide Curtain Twitchen with its edge. C south, until 28 Aug, 6.50pm, £7.50–£9.50 (£5.50–£7.50). Aerial-circus with stand-up comedy and a power pop soundtrack.